In 1894, Eastern Learning rose against tyranny when the Joseon dynasty lost power and was about to fall. One year later, after the Empress of the Joseon dynasty was brutally murdered by the Japanese, a resistance arose against Japan. Around that period, the Eastern Learning army gathered 600,000 soldiers, mostly farmers. But against the Japanese Special Forces and the Joseon government army, they were defeated and around 300,000 people were cruelly massacred. In 1897, King Gojong changed the name of the country from ‘Joseon’ to ‘Daehanjeguk’, the Great Han Empire. (대한제국 大韓帝國). But the newly-founded nation collapsed after only 13 years in 1910. A decade later, the True Eastern Learning emerged. According to the Pentagon’s report at that time, originally known as Bocheongyo, 6 million seekers of the dao of the true eastern learning gathered. That means that 1/3 of the population of Korea at the time were seekers of the true eastern learning. (It was the beginning stages of Jeung San Do) Bocheongyo built a grand scale palace bigger than the main palace of the Chinese Emperors. The Bocheongyo’s history was the rarest and the greatest spiritual growth in human history, and is now actively studied in academic circles. At the time when the independence movement was active after Korea lost to Japanese Imperialism, Bocheongyo supplied most of the funds of the independence movement, led by the provisional government, which helped establishing the government of the current Republic of Korea. However, when the Japanese Imperialists received Information that the supporting funds for the Independence was coming out from Bocheongyo, they started eradicating Bocheongyo. In 1937, when the leader of Bocheongyo passed away, they forcefully disassembled the Bocheongyo headquarter. 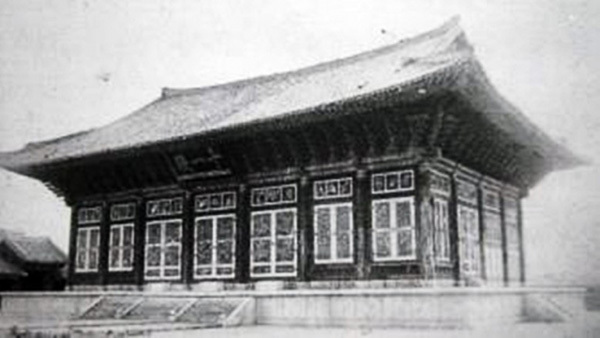 The main shrine, Jogye-sa, of the headquarter for the Korean Buddhist Jogye order was built by using scraps of wood taken from the Bocheongyo palace.